The Western Australian leg takes in many of the State’s unforgettable landmarks. 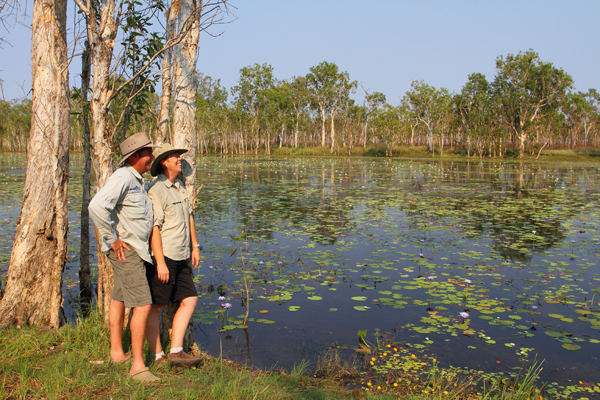 It can be travelled on the Great Northern Highway or, for a real 4WD adventure, along the Gibb River Road. This legendary 660 kilometre trek, which starts in Kununurra and ends in Derby, is one of Australia’s premier outback drives. Kununurra is the home of the mighty Ord River. Here, you can take a refreshing dip in a freshwater pool and watch crocs basking on the riverbanks. The magnificent Geikie Gorge National Park is just 18 kilometres from Fitzroy Crossing – a must-see. The tempestuous river is framed by untamed forest, rich with native figs, wild passionfruit, freshwater mangroves and river gums. Halls Creek, another stop along the Great Northern Highway route, is the nearest town to the glorious Purnululu National Park – home of the breathtaking Bungle Bungles. A short drive from Halls Creek, you’ll also find Wolfe Creek Crater – the second largest meteorite crater (880 metres) in the world. The meteorite is believed to have crashed to earth around 300,000 years ago weighing more than 50,000 tonnes. In Broome, visit famous Cable Beach – hailed as one of most beautiful stretches of coastline on earth. This idyllic spot is blessed with azure waters fringed by 22 kilometres of pristine white sands, and is renowned for its spectacular fiery sunsets. For more information on the route, visit the Savannah Way website.